Total Commander File manager for Windows AVZ Antiviral Toolkit Advanced tools capable of removing SpyWare and AdWare modules. Recuva File Un-delete Smart Partition Recovery Lose a drive? Smart Partition Recovery will restore it! 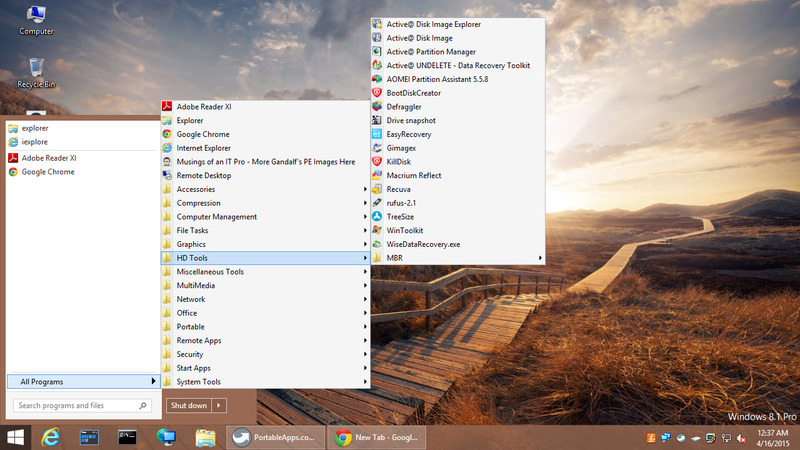 If you prefer to use the Portable Apps menu instead then run the Portable Apps Menu shortcut on the taskbar. The portable apps menu also allows you to download more apps by selecting the Apps>Get more apps. These freshly downloaded apps will be saved to the USB drive. Very impressed, but for some reason wont able work on Lenovo Thinkpad 11e(64bit), it just froze, any idea why, bc any other system work fine. Thank you..
Maybe connected with UEFI/BIOS boot mode? You may also check my other comment below. – create a new ISO by ImgBurn or mkisofs from the contents of mounted ISO. The second method is through creating a bootable USB by Rufus, then creating a new ISO by ImgBurn or mkisofs. This method enables adding custom stuff to the ISO image. Sometimes I’ve got boot errors, dependent on configurations how ISO was created. Common reason was boot error 0xc000000e related to configuration file \EFI\Microsoft\Boot\BCD. File “Gandalfs Win8.1U1SE_x64 updateable final.ISO” is undonloadable. I can’t download whole folder from folder actions menu too. Every time click redirect me to https://login.live.com login page. New permissions still block downloading “Gandalfs Win8.1U1SE_x64 updateable final.ISO”. The x86 version “Gandalfs Win8.1U1SE_x86 updateable final.ISO” can be downloaded without problem. Not sure whats up with the onedrive permissions but I have added a mega download link. Thank You alternative solution, but there is another problem. Downloading of “Gandalfs Win8.1U1SE_x64 updateable final.ISO” from OneDrive is still blocked. File “Gandalfs Win8.1U1SE_x64 updateable final.ISO” downloaded from “Mega” has different checksums than expected. I try three different method of downloading (.zip of all files, .zip of .iso file only, direct .iso download), result is always the same. Maybe redirecting to OneDrive login page means problems when file was uploaded and now it contain errors? The x86 version and previous versions was downloaded without problems from OneDrive without logining. I am re-uploading to the onedrive. It is the same version as on mega. Should be complete in about an hour or two. For Onedrive: rightclick on the ISO and choose download with a left click. Don’t just left click everything XD. Is there any way to install it to, for example, the hidden Windows boot partition (suitably expanded in size) on a hard drive? And then select it as an option in the Windows Boot Menu, and carry out maintenance ‘outside of Windows’ without needing to use any external media? For years I’ve dual-booted between DOS & Windows for making disc images etc. but the arrival of UEFI BIOS & GPT drives has finally put paid to that. Many thanks…. Sorry I now have a problem with my new machine — I can boot into WinPE but it doesn’t see the computer’s internal drives / partitions – only the RAMDrive & the USB drive. I prepared the boot USB drive using Rufus, and selected UEFI BIOS & GPT for the target system (which is how it’s configured). Am I doing something wrong? Am I using the wrong build of the software? Advice much appreciated…. Thanks for the great utility disk. I am having one issue, I am unable to burn the ISO to a USB drive. I have downloaded it 3 times, used 2 machines and have used Rufus as well as ISO to USB. Has anyone else come across this error about 15 to 20% in? Thanks again. try downloading from the alternate source if you haven’t tried already. I think the issues was my company network. I went home and was able to create the USB i desired. Thank you very much! I have windows 7 as main OS. You have included Aomei software in the new version of x64 but it’s just for PARTION. Would it be possible to include Aomei BACKUP in the next version of x64. Macrium Reflect and Active Disk Image have only DISK PARTION backup; both lack FILE DATA Image Backup. My great appreciation for your work and many thanks. Hey I was wondering how I would go about customizing this image. Every time I boot from it and make a change, it reverts back after a reboot. Any thoughts? Will it work to unlock a bitlocked partition? I mean does it has the bitlocker application in the control panel? It should though i have never tried it. The bitlocker components are installed but you will have to run a search for bitlocker in the x:\windows folder . There are a bunch of apps there related to bitlocker and i noticed a bitlocker to go app as well. I burnt one dvd from x64 iso and worked, but now I find that other DVD I create from the same iamge won’t work. They burn without error, but when I boot from them: I have hit boot from cd a second time and get an error when I run app I need (Active Image) that I need to run the 64 bit version from the menu provided. I am using CD Burner XP to burn the ISO. Just weird. indeed. This version is really intended to be put on a usb flash drive. Then you can easily update the apps on the usb flash drive. 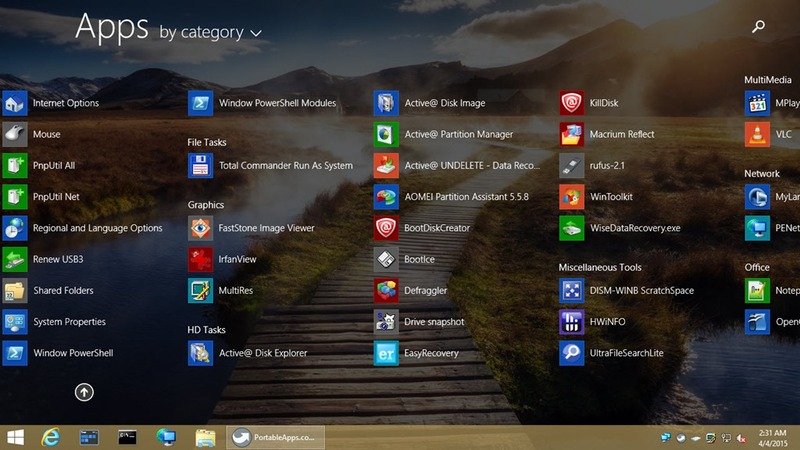 How did you manage to get search working on windows explorer? I’m using win8.1se builder and for the life of me I can’t get it to work! Many thanks for the build. I found one issue with it. I made a bootable USB from the ISO and after booting to WINPE, all the system files are on Drive X: and portable applications are on Drive Y: (labelled PortableApps) as expected. However, The drive letter Y: will change to one of the other available letters, which happened automatically or was triggered by applications like Rufus. This results in the hard coded shortcuts (Y:\Programs\xxxx.exe) invalid. PE U1 X64 is still not downloadable in neither of the 2 links. both working for me. Try a different browser or different computer. 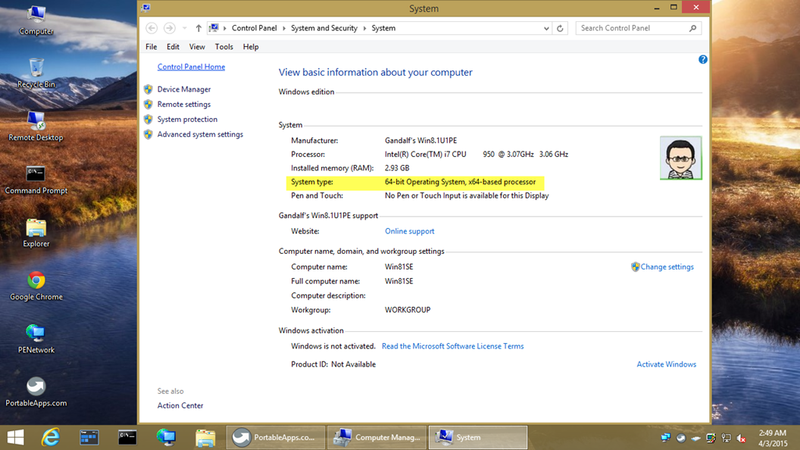 Win 8.1 PE can run as UEFI ? I manged to install this ISO to UEFI-bootable USB stick and it boots on both Oracle VirtualBox (using the “Virtual Machine USB Boot” software – since it may be problematic to boot from physical USB drive in VirtualBox) and on my laptop (Acer Aspir V3). Preparation is easy by Rufus (I used version 2.7.855), you extract Gandolf’s ISO to a directory (just double click on Win 8 or higher, or use Daemon Tools Lite or something similar to either extract ISO files or mount them as virtual drive), then in Rufus: point to extracted directory (drive mounted from ISO) under “Device”, select UEFI under “Partition scheme and target system type”, select FAT32 (many UEFI-based systems will not be able to boot from NTFS-formatted disk) under “File system” and check “Create a bootable disk using …” – in the drop-down menu you can select ISO image. Gandalf, this is truly a great compilation, it saved me a lot of time. I happened to notice that \windows\system32\boot\winload.exe inside boot.wim is not correctly signed with the Microsoft cert, and is different from the one in my non-PE installation. Has that file been tampered with? For what reason? not that I’m aware of. Inject what you feel is the correct one and let me know what happens. I noticed this when trying to dual boot between WinPE and regular 8.1 x64. The standard Windows boot manager refused to use the bootloader of the .wim, with reference to it not being signed properly. I applied the .wim to a partition and replaced winload.exe and then it worked fine. I have not yet tried the regular winload.exe with the boot manager of your ISO. I’ll let you know if I do. Hi, Gandalf. Looking fwd to using your PE project soon, but would like to know: can your WinPE automagically mount the registry of the “other” system ? Once upon a time, I maintained a PE project called HawkPE and mounting the”other” PC’s registry was part of the process for better malware cleaning. Just asking, not looking for a update or fix. Be well…. does your drive have enough space? Dear “Gandalf”, Thank you very much for your PE edition of Win8.1. It just worked. Eventually I managed to update the Bios of my Lenovo B50-30 running on Xubuntu 14.04. I discovered your site from a discussion over at Raymond.cc and thought I’d give your handiwork a try. I’d like to report that it worked flawlessly and it’s great to be able to boot from a USB into a Windows environment instead of having to boot into Linux Mint to access a problematic hard disk. I downloaded the “Gandalfs Win8.1U1SE_x64 updateable final.ISO” and burned it to a DVD. A bit slow to load but it worked fine. Then I made a bootable USB 2.0 stick, and while it loaded faster it was still a bit pokey but after it loaded, everything worked fine. I’ve used Easy 2 Boot for quite a while and really like the flexability it gives me to be able to boot any number of ISO’s. So I though I’d see if your PE image would boot using E2B. Sadly there were some problems. Doing a bit of research I followed the instructions to rename the ISO with an ISOPE01 extension and then created a WIN8.1SE.ini and put it in the root directory of the USB stick. Info2 = change the name and path of your ISO file in the last line below ( e.g. _ISOMAINMENUWin7PE_x64.ISO). Info3 = Copy this file to the root of your E2B media only. 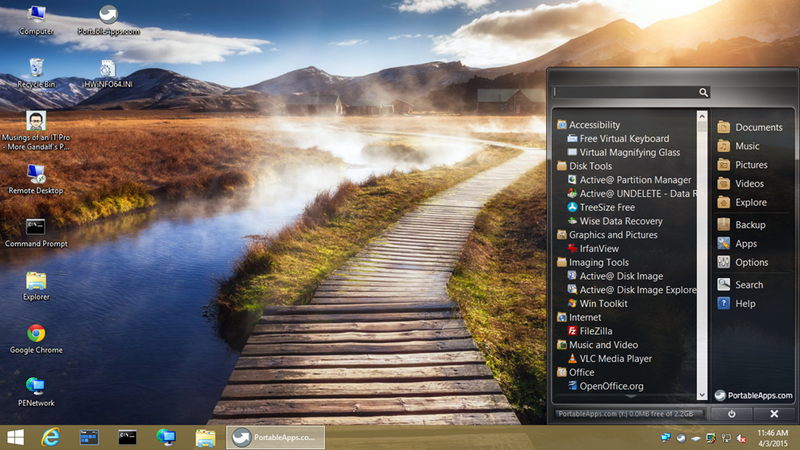 Info4 = At startup of WinPESE, the ISO will be automatically mounted on drive Y: and the Desktop icons should all appear. I also put CdUsb.Y in the root dir as well. When I started it up, it loaded fine, and the desktop appeared, but it didn’t include the Portable Apps Menu as the DVD and dedicated USB did. When I selected “All Apps” the all showed up, but many of the icons were greyed out, so to speak, and when clicked, gave an error message. I don’t see any way to attach images, so here’s a link to my Google Drive with screen captures of what happens when you boot from Easy2Boot. I checked the original ISO and all of the portable apps are there, they just don’t load when run under E2B. It would be nice to be able to include your WinPE image on my E2B setup but it’s not the end of the world if it can’t be done, or is a hassle on your end. Gandalf. Thanks for the reply. I will try ntpwedit. Different question. I wondered if it would be possible to put the entire Hirens Boot CD on a stick as a directory or subdirectory? Probably not but it was worth asking. Is it possible to load the apps from Hirens to the 8.1 stick? If I am treading on anyone’s toes, please forgive. Hirens disk won’t start on my 8.1 because of the UEFI and I have tried everything to change the boot order so that a CD or Flashdrive will be seen. Nothing has worked so far. Yes, I turned off Secure Disk but didn’t turn on Legacy Support because it will trash the windows install. I will try your disk shortly to see if the UEFI will see it and allow the computer to boot off the flashdrive. Thanks you. I tested your disk in my Pavillion 15 with Secure Disk off and UEFI on and the UEFI wouldn’t allow it to boot. I had the boot order FLASH CD/DVD HARD DRIVE which should have let it work. I did the double try password trick to use the restart system and that didn’t work. I also tried F9 on start up but your 8.1 disk wasn’t on the list of bootable objects. Macrium has a rescue disk that gets put in the boot order but there aren’t very many tools on their stick and no way of adding apps. Their gig is backup and restore so that is what their stick does. No password hacker. I put all of this in the post so others who are having the same problem will know what I tried. Thanks. Beter to use for the software 8.1 enterprise, es is only portable windows. Thank you for this PE. But I can’t connect to internet. nothing there in “Change Adapter Settings”. Is this a driver issue? If so, how can I include my network interface drivers? thanks. Nothing stopping you from writing it to DVD. But some apps that need to write data will not function properly.